There is a relatively fixed universe of stocks to buy in the US. The Wilshire 5000 is made up of almost every single nationally listed, SEC-reporting company on the NYSE, AMEX, and Nasdaq, and is comprised of about 6,700 individual companies. For the vast majority of American stock investors, institutional and retail alike, that’s where their investment money is going to go. And when the Fed creates an investment universe in which banks are simply awash in ZIRP cash, a lot of that money is going end up bidding up this relatively limited pool of equities. The underlying fundamentals, over this totally artificial and rigged period of time, barely matter. Tons more investable cash and a static pool of investment targets means those target are going to be subject to significant inflationary price pressure. Inflation should be caused by normal market responses. However, when the government keeps asset prices artificially high, the result is an inevitable rise in assets prices while purchasing power self-destructs. How does this happen? When central banks purchase stocks and bonds and turn into investors, interest rates are kept low, and borrowing becomes easier. Money becomes cheap as the central banks keep throwing piles at commercial banks, who then lend it out to consumers. 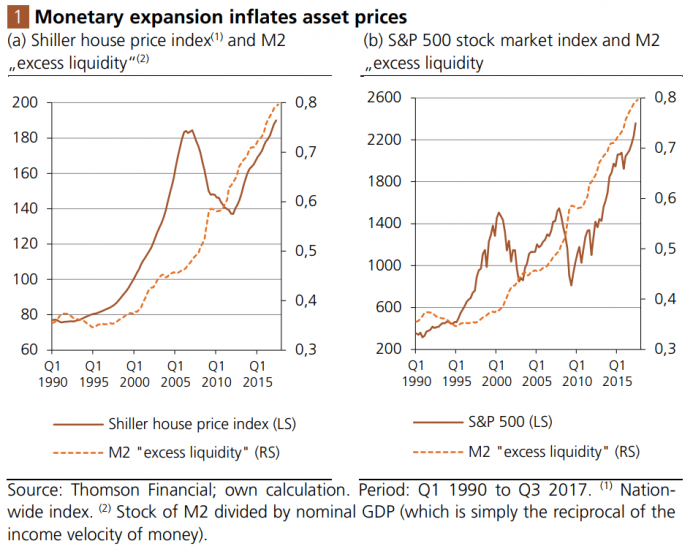 This artificial stimulation of the economy and excess liquidity inflates the value of assets in ways that can’t be sustained without continuously feeding the asset bubble with more money. Eventually, the central banks printing press will need to slow down and stop flooding the market with devalued money. When that happens, the asset bubble is likely to burst, and we could be facing an economy on the verge of a recession. The US dollar is the most influential currency in the world. Excess US dollars have held up global financial imbalances during times of crisis. If the dollar collapses, so does the global economy. East Asian and Middle Eastern countries are holding massive dollar reserves. If they ever decide to recklessly sell U.S debt, chaos will be the likely result. The current global financial situation is spinning on hopes and artificial central bank intervention. When reality hits, the global asset bubble burst could get ugly.